The perfect place to show the Realme 3's gaming capabilities! Announced last month, the Mobile Legends Pro League will be back for a third season, and it’ll once again bring exciting ML action featuring the country’s best players. Supporting the 3rd season of MPL is Realme — the brand recently announced that it will be the official Epic Sponsor of the league. 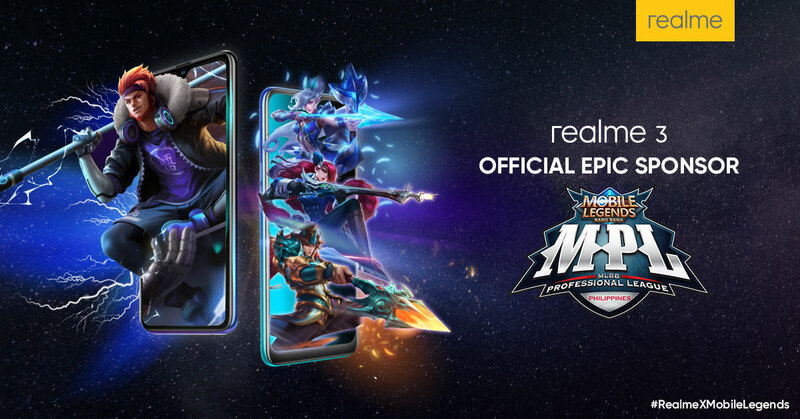 As the Epic Sponsor of MPL, Realme will be able to solidify the position of the upcoming realme 3 smartphone as the premier budget smartphone for gaming. “Realme 3 with its powerful Helio P60 processor and affordable price tag elevates the gaming experience of Filipinos. That’s why we have partnered with Mobile Legends: Bang Bang Professional League Season 3 to show the capabilities of this revolutionary smartphone. Expect exciting activities and activations from Realme and Mobile Legends and be ready to win big prizes,” shares realme Philippines Marketing Lead, Eason de Guzman. Additionally, Realme Philippines encourages amateur and aspiring Mobile Legends players to join in its upcoming community tournament. Open to all members of Realme Philippines Community Official, the tournament registration starts on March 22 with the qualifiers beginning on April 8 and finals on May 2019. The grand winner of the community tournament will win Php 25,000 and a realme 3 smartphone. For updates on the Realme community tournament, visit the realme official Facebook page.